In 2015, I stood at the edge of the East Branch of the Penobscot River in the North Woods of Maine. Chickadees tittered in the trees above my head, hopping among the green leaves just barely tinged with the gold and red hues of the incoming autumn season. My husband and father waded chest-deep in the current, fishing, while my mom and I sought additional bird species with binoculars. It was quiet, save for the rippling of the river and the gentle swish of wind blowing through the canopy. Almost exactly a year later, the spot I stood on became part of the Katahdin Woods and Waters National Monument, designated by President Obama. Less than a year after that, its boundaries were under review once more. National monuments across the United States are under review by the Department of the Interior as a result of an executive order signed by President Trump. From the deep forests of Maine to the mountains of California, 27 designations may be eliminated or reduced in size (though some scholars doubt the legality of either move). In preparation for a decision on these monuments, the Department of Interior opened public comment, perhaps unprepared for the avalanche of responses. When the portal closed on July 10, 1,459,940 people had commented, including me. Make no mistake, this is a lot. The Natural Resources Council of Maine staff spent 120 hours conducting a review of the comments centering around the Katahdin Woods and Waters National Monument, which totaled over 192,000 when they pulled the data on July 4, 2017. The results? Graph used with permission from the Natural Resources Council of Maine. Though this is only one of many monuments under consideration, the overwhelming support delivered through the public comment period should send a clear signal to the administration about changing past monument designations. In addition to protecting natural habitat and unique ecosystems, the monuments can create economic boons in local areas as visitors flock to see the protected areas. 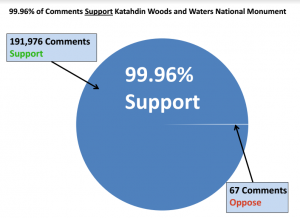 As we move forward, public comments represent critical opportunities to amass widespread support for environmental issues. While it may be difficult to follow all the proposals and rule changes, pay attention to watchdog groups and take just a few minutes to make your voice heard. Regulations.gov even has a “trending” section! 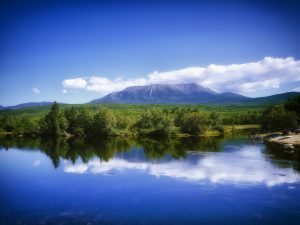 When I close my eyes, I can still picture the magnificent views of mountain slopes, river shorelines, and emerald trees of Katahdin Woods and Waters. I hope the overwhelming public support will maintain the monument now and into the future, so that others from around the state, across the country and throughout the world can stand where I did and enjoy a beautiful afternoon in the Maine woods.